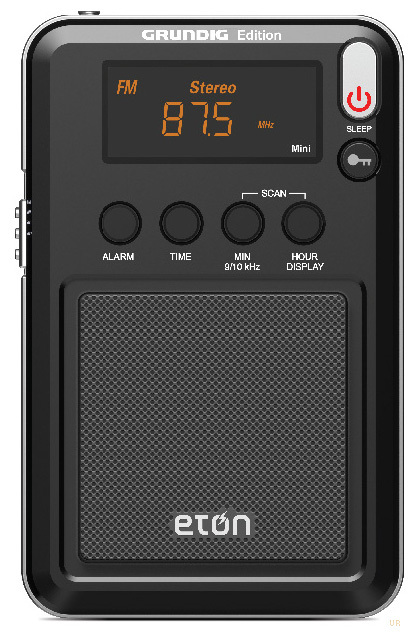 The Eton Grundig Edition Mini is a very compact radio that will literally put the world in your pocket! It receives the regular AM and FM bands, plus the international shortwave bands in the range of 5.6-10 and 11.65-18 MHz. The radio's controls are easy to use. Features include: rich orange digital display, scanning, metal grill, clock-alarm with sleep timer, key lock and mini earphone jack. The display background brightness may be set to: Off, Low or High. The radio may be powered from two AAA batteries (not included) or optional MW41-310+ 3 Volt AC adaptor. Comes with carry pouch. 4.3" x 2.7” x 0.47” 7.5 oz. (70x110x14mm).